I got busy working and almost forgot to post today! 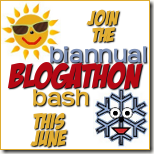 I signed up last week for the Blogathon Bash. It’s a weekend-long clean-up-your-blog event. With two full-length books and a novella to edit this weekend, I wasn’t sure I would get to any of the tasks, but I signed up anyway. And didn’t get anything done. It ends at 8 a.m. tomorrow morning if you want to jump in and try to get something done. I’ll just have to wait for the next one. This entry was posted in Blogging by Amanda Beaty. Bookmark the permalink.